Photographed at the computer museum at Bletchley Park, England. May not currently be on display. 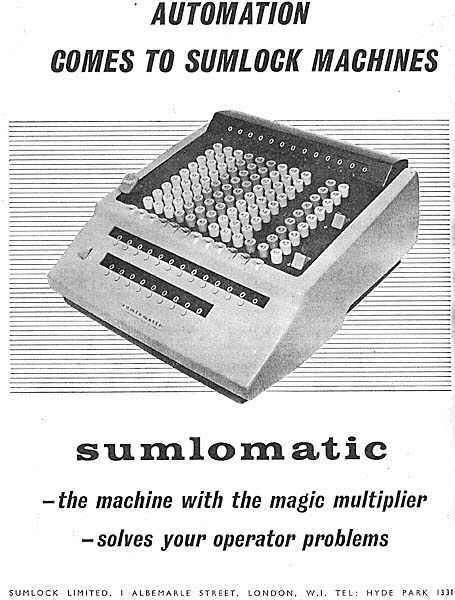 Launched as the Sumlomatic the model was apparently renamed the Comptomatic (and given a number in the 993 series) after the Bell Punch Company came to arrangements to manufacture machines for Comptometer Corporation in 1961 - see brochure below. A full keyboard, electrically driven, "Comptometer" type machine with a storage register and a multiplier register. The machine illustrated is a Sterling Currency (£sd) model. The lowest set of dials is the multiplier register; keyboard amounts transferred to it can be locked in to provide a constant multiplier. Two versions are listed in catalogues: model 909 (with 9 columns of keys) and model 912 (with 12 columns of keys). The model 912 was available in decimal, Sterling currency (£sd), and time versions, "at no extra cost". "The star on the Sumlock stand is the Sumlomatic. This is a new key-driven calculator with a multiplier register as well as the usual working register and store register. Digits for the multiplier (the lowest-register in the illustration) are set from the keyboard by means of a transfer button (seen on the right) which is also used to transfer digits from the working register to the store register. For repetitive multiplication by the same factor the multiplier register is provided (on its left) with a locking switch. The large key seen to the left of the board is the multiplier control. Whilst addition and subtraction can be in £ s. d., multiplying must be in decimals. Division is done by turning to a printed table of reciprocals and then multiplying. In busy commercial offices where several kinds of computation are done, the use of the Sumlomatic will undoubtedly lead to a daily saving of many thousands of key depressions as compared with previous models. This remarkable new model weighs 34lb. and costs £330 [about US$900]." Advertisement for the Sumlomatic, from June 1959. 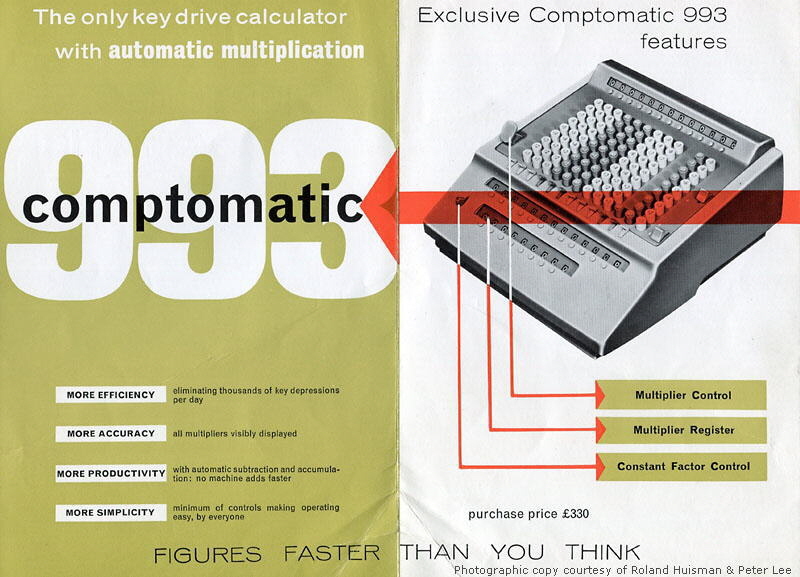 Sales brochure for the Comptomatic 993, which is identical to the Sumlomatic. Office Magazine, Jun 1959, p500.